Situated in Vermont's Green Mountains northeast of Burlington, Smugglers' Notch Resort stands out for its appeal to families and kids. The central village of unpretentious and colorfully painted wooden structures huddles at the base of the ski slopes, which are covered by grass in summer. Guests are drawn by the casual atmosphere and abundant activities, many of which—like the heated swimming pools, water slides, guided hikes, an indoor FunZone, and nightly entertainment—are included in the package rates. So are award-winning all-day children's programs. Lodging ranges from one-bedroom studios to five-bedroom condos, clustered in five different communities. Free on property shuttles make getting around easy. 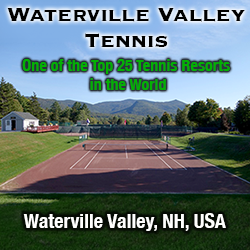 With eight clay and two hard courts, Smugglers' Notch has long made tennis an optional activity during the height of the summer season. Co-directors Will Brooks and Mike Boggs devised the programming to fit within the context of a family resort. "We're not the place people are bringing their 4.0 tennis teams," Boggs told me when I visited. "We want to provide the best tennis we can while running family programs." To that end, the resort offers a variety of add-on options, including an Early Risers clinic for ages 5 to 8; a junior camp for those 10 to 17; an hour-long Discover Tennis clinic for adults; and a TenPro Tennis School, the last of which consists of 90-minute group classes (6:1 student:pro ratio) focused on technique, strategy, and match play. Courts & Fees. There are 8 clay (4 with lights) and 2 hard courts. Court fees: $17/hour during the day, $12/hour after 6 pm. Golf. Although the resort does not have a golf course, it does have a driving range and offers golf instruction, the latter for all ages, and can make arrangements to play at golf courses in Stowe and South Burlington. As an alternative, it does have its own 18-hole "Disc Golf Course" (think Frisbee with targets), laid out through the woods. Spa & Fitness Center. While it doesn't have a spa per se, it does have a massage center offering such treatments as aromatherapy, sports, deep-tissue, and Swedish massages. The weekly calendar also includes a variety of relaxation workshops, among them yoga and meditation classes. And ... Apart from the activities already mentioned, there is a climbing wall, skate park, sand volleyball, basketball, shuffleboard, horseshoes, a giant swing, Segway tours, and more. Many off-property excursions can be booked as well, including canoe and kayak trips, backroads biking, and guided fishing trips. The resort has well-thought-out programs for every age group, with an appropriate number of counselors. In general these program runs from 10 a.m.-4 p.m. There is also a separate program for teens ages 16-17 and a WiFi-equipped teen center, where they can gather for music, video games, dance parties, and more. Like the resort, the options are casual and family oriented. Morse Mountain Grille is open for breakfast, lunch, and dinner with evening entertainment provided by the Friendly Pirate and Friends and Marko the Magician. Otherwise choices include a deli, pizzeria, and an ice-cream shop (Ben & Jerry's naturally). Seasons. The organized tennis programs are offered from mid June to Labor Day. Travel Instructions. The nearest gateway is the newly renovated and expanded Burlington International Airport (BTV), roughly 35 miles to the southwest. General Tourist Information. for general information about travel in Vermont, visit the Vermont Department of Tourism and Marketing website or contact them at 6 Baldwin Street, Drawer 33, Montpelier, VT 05633-1301; Phone 800-VERMONT (800-837-6668). Here's what others have had to say about Smugglers' Notch Resort.